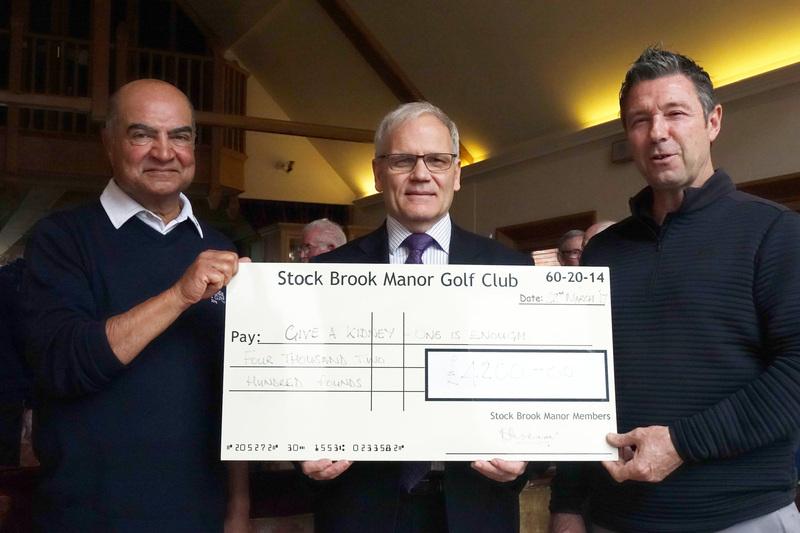 Billericay’s Stock Brook Manor Golf Club Seniors last year raised more than £4000 for Give a Kidney. The funds were raised through raffles and competitions at various events organised for the Seniors including a Ladies Night, Captain’s Night, Captain’s Away day and Three Captain’s Charity Day. Almost £1000 was raised by a pound forfeit per ball landing in the water surrounding hole 4! Bob Wiggins, met Shoky to accept a cheque for £4200 on behalf of Give a Kidney. He said: “We’re very grateful to Shoky, Craig Laurence, the Senior section of the Club, and to everyone who supported the fundraising so generously throughout the year. We are a small charity with a big ambition – that one day there will be no-one in the UK waiting for a transplant for want of a kidney.